There are bags piled high in the All Star office—each one filled with clothing for kids, teens and adults. 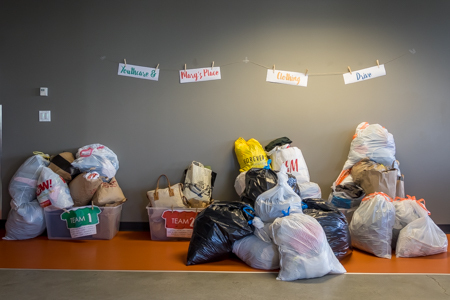 In true spring cleaning mode, All Star employees went through their closets to find gently used clothes to donate to our downtown neighbors-in-need. All donations go to YouthCare and Mary’s Place, organizations that provide housing, health and wellness services for the homeless. With 162 hours of volunteer time last year, All Star is ready to keep the momentum going. Working with YouthCare and Mary’s Place is one way we can do that, and make a lasting impact. For the month of February, we gathered clothing donations for all ages, and the results were impressive. All Star employees generously donated 432 items for the YouthCare community and 258 items to Mary’s Place for a total of 690 donated items. YouthCare specializes in helping youth ages 13-24, providing a continuum of care that includes housing, emergency shelter, education, health services and counseling, among others. “It’s a really joyful place full of people who care deeply about kids. They were thrilled with the clothes, which of course made me really proud of what we’d done,” said Senior Account Manager Courtney Crooks. In the past, All Star has prepared and served meals for the YouthCare community. With over 4.2 million homeless youth nationwide, organizations like YouthCare are more than necessary. Mary’s Place is an organization dedicated to homeless women, children and families not only for emergency housing, but for tools and resources to help them with wellness and employment. Mary’s Place has seven shelter locations and a Day Center that provides food, showers, laundry services, discussion groups, classes and health services. Executive Chairman Doug Brown touched on the impact organizations like Mary’s Place provide. “During a 60 Minutes broadcast on March 11, 2018,” he recounted, “Dr. Bruce Perry said that overcoming childhood trauma requires ‘a relationship, or a helping hand, or some kind of healing process.’ Six All Star volunteers participated in that healing process when we took grade school kids by the hand and helped them pick out shoes, backpacks and supplies in preparation for going back to school in September 2017. It was a joyful day none of us will forget. Mary’s Place provides us all with opportunities to help disadvantaged or traumatized kids to overcome destabilizing events and circumstances.” With more opportunities to reach out to our downtown neighbors as the year goes on, we’re excited to continue our partnership with YouthCare and Mary’s Place.